More than half of the nation’s forestland is privately owned, but in the coming decades, these acres will transition to a new generation of forest landowners. Many of these individuals do not have the same connection with the land that their parents and grandparents had. Will they accept the need to manage their woodlands? Will they see the value the forest provides? According to recent data, “80 percent of family forest landowners want their land to stay intact and remain in the family. They have no intention or desire to sell their property.” Yet, only a small percentage of families invest the time to talk about how to transfer ownership and maintain forest health for future benefits. This leaves our forests vulnerable to fragmentation and ultimately to a change in land use. There is important information to pass down, like understanding timber tax laws, conservation easement options, the value of having a forest management plan, available cost-share programs, and knowing local forestry professionals who can help with management. Perhaps most importantly, there is a need to share the benefits a forest provides, not only for the family but for the communities and wildlife that rely on it. 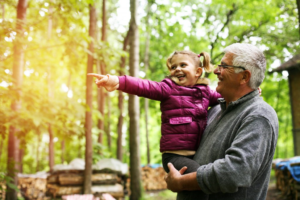 Forest succession planning involves a series of steps, often facilitated by a qualified professional armed with resources to address each step in the process. The most important step is the first step—initiating the conversation. 1. Discuss and write down your goals (vision) for the property and the family. Having information written down will give you more control over the land while providing concrete thoughts and desires for family members. Conservation district and university extension offices, as well as other forestry agencies, will have resources to help begin this process. Goals may include keeping the land intact or in the family as well as various land management options. 2. Discuss these written goals with your family. There must be an effective and intentional plan in place to communicate with family members. Otherwise, intentions may not be followed, which can put the future of the land in jeopardy, especially if you want to keep it intact. Individual family members may have differences in values, goals and/or lack of critical skills. Discussing plans as they were written will help members better understand and ask questions or clarify objectives. 3. Create a family business entity to own the land. The LLC has become the preferred entity for many landowners because of business control and liability protection, but there also are corporation options and revocable trusts. Experts can help identify the best options for each individual situation based on the discussions on goals of families. 4. Have regular family meetings to discuss the business and share your passion. Different life events may prompt changes—births, deaths, marriages, etc. Ideas or questions may pop up, including how to divide the land equally versus fairly between children and/or grandchildren. Some may want the benefit of the land but not the responsibility. As time passes, individual priorities may change. Ensure that what is most valued about the land and what heirs value most continues to line up for future goals. 5. Set family employment policies before you hire any family members. If family members are to be involved in the day-to-day management of the land, it may be advisable to approach this from a business-like perspective and determine what the employment policies are. The process of getting to an agreement may be challenging but can head off problems down the road. 6. Discuss and write down important decisions. 7. Create non-financial reasons for the family to keep the property. Transitions can cause the land to be at-risk as finances may look more appealing, but if there is an emotional connection or natural interest in the land, the value of keeping and maintaining it is higher. 8. Get your kids and grandkids out to work and have fun on the property. Have treasure hunts, explore the land, collect wild food (berries, hunting, roots, mushrooms), and tell stories. Talk about the benefits of the forest as a whole, while finding specific inspiration in the land and wildlife. Creating memories will develop heart connections with the land and solidify the values shared for the land. 9. Create a governance structure that will survive your passing. Choosing a legal structure to keep the land intact and establishing patterns keeps families connected to the land. Developing a governance structure includes identifying stakeholders, outlining roles and responsibilities, and developing rules and guidelines to follow in maintaining the vision for the land. 10. Remember to have fun. Enjoy spending quality time with your family on the land. Note: This article from NACD’s Forestry Notes Blog focuses on Forestry land, but the same principles apply to other conservation land as well!